Apache Stronghold will be holding their 4th Annual March to Oak Flat with events beginning on Thursday, February 15 with a Holy Ground Blessing ceremony with 16 songs at the Old San Carlos Memorial. Following the blessing, the Sacred Run will begin with the evening’s end point at the San Carlos Tribal Administration Building. On Friday February 16, at the San Carlos Tribal Administration Building, the participants will be addressed by the San Carlos Apache Vice Chairman Tao Etpison. The Sacred Run and March, consisting of alternation runs and marches will continue throughout the day. There will be a blessing and acknowledgment of the Crossing of the reservation line at the San Carlos Apache Reservation boundary. The evening’s end point will be near Dollar Tree in Globe, AZ. Dinner is provided. On Saturday, February 17, the March will continue to the end of Miami and then the Sacred Run will take the staff entering Oaf Flat campground by 12:00 noon. The Poor Peoples Campaign representative speaks and lunch will be provided. There will be Pomo and Aztec traditional dances to bless the area, Art and Music festival. Dinner will be provided and there will be a Gaan blessing at Dusk. On Sunday, gathering at breakfast provided at Oak Flat. Nature Hikes continue. We will close with Holy Ground Ceremony with 16 songs. The Southeast Arizona land exchange was one of the bills that was attached to the National Defense Authorization Act and passed by the U.S. House and the Senate. It is a bill pushed by Arizona Representatives Gosar & Kirkpatrick and Arizona Senators McCain and Flake (and prior to Flake, Kyle) which for over the past years was not been able to get enough votes for passage in either the House or the Senate. The Arizona Congressmen could not get the bill to pass using the normal Congressional procedures. This is because the bill gives land at Apache Leap and Oak flat in southeastern Arizona to a foreign Mining Company, Resolution Copper without any environmental impact studies or without consultation with San Carlos Apache and Tribes that consider the area sacred. The last time the bill came up for vote in the House of Representatives it was shut down by New Mexico Representative Lujan who proposed an amendment to the bill that required that Native American concerns regarding Sacred Sites be addressed. Because Gosar and Kirkpatrick did not want that amendment added to the bill, the vote was delayed and never moved forward. If the Bill was to go to a vote again in the House of Representatives, the Lujan sacred sites amendment could have been added which meant that the sacred site issue would keep the exchange from taking place so it never came up for a vote in the House again. Until it was added to a land package and when introduced on the floor touted the rule that the entire National Defense Authorization Act could not be torn apart and all riders added would go as a package. This bill was then snuck in a land package added to the National Defense Authorization Act that was signed by Obama to fund the U.S. Military. The San Carlos Apache tribe has worked tirelessly to avoid this from happening. The discussions of the land package in the House and the Senate did not cover the bills history, all it covered was “jobs”. The scariest part of the presentation in the U. S. Senate of the land package was the discussion regarding all the land in the Western United States. A map showed that the States in the West had enormous pieces of property what is U. S. Trust Property this includes all reservations in the West and all land that is held by the federal government including numerous Sacred Sites, including Oak flat. The bill passed and became law, but has many hurdles to pass in order for the exchange to take place. 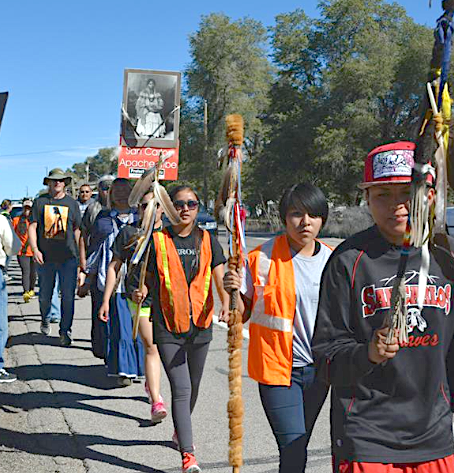 The March to Oak Flat grew out of recognition that this land was taken by bypassing all environmental and cultural laws and the fact that Indigenous homelands exist beyond the current Reservation borders. The borders are begin used to keep us in and laws are being bypassed without concern for the environment, the water, cultural properties and much more. On Friday, February 9th, 2018, Dr. Casey McKeon, Environmental Manager for Resolution Copper, testified in Arizona State Court about past and current permits and water treatment issues. Dr. McKeon reported on remediation and reclamation of past and ongoing mine tailings and said that pond tailings have been consolidated; actions are being taken to divert storm water in order to prevent water infiltration into tailings ponds. She said that water that infiltrates the mine is piped to farmers, who use the treated water for irrigation purposes at 900 to 1000 gallons per minute. The doctor admitted that she does not personally take water samples, and that the last time she reviewed Resolution Copper's General Plan of Operations was in 2013, when the plan was written. The hearings continued on Monday, Feb. 12th at 9:00 a.m., with Dr. Wells testifying as expert witness for the San Carlos Apache Tribe.